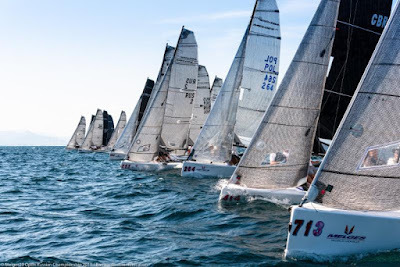 Cagliari, Italy (October 9, 2018) - The International Melges 20 Class Association (IM20CA) has officially reached its peak point of the season. Tomorrow on October 10, the first warning signal will fire for the start of the 2018 Melges 20 World Championship hosted by Yacht Club Cagliari. Filippo Pacinotti's BRONTOLO stormed the fleet by winning the Forio D'Ischia circuit opener, then closed the deal in Cagliari to earn the title of 2018 Melges World League, European Champion. Defending World Champ Drew Freides' PACIFIC YANKEE claimed a big win in Scarlino, and is now on station in Cagliari with his steady American crew of tactician Morgan Reeser and Charlie Smythe. 2012 Melges 20 Gold Cup Champion Dario Levi at the helm of FREMITO D'ARJA took top honors in Lerici. And last but not least, but most certainly the one to watch is Igor Rytov's RUSSIAN BOGATYRS. He is no stranger to Melges 20 success and together with Konstantin Besputin, he captured Riva del Garda in July, Cagliari in September, then triumphed this past weekend at the Russian Open. For sure Rytov's agenda must include the task of adding the title of World Champion to his already long list of accomplishments. Standing on the sidelines in attack position is Achille Onorato's MASCALZONE LATINO JR. with Paul Goodison as tactician, and current Melges 20 World League Ranking leader - Vladimir Prosikhin's NIKA with Michele Ivaldi calling tactics.